I always wanted a blue Adamas, but after the end of the Kaman era their prices became crazy. When this one appeared on the classified website at the end of 2018 I could not resist and got in touch with the seller, in spite of a very high request. To my great amazement, the nickname hid a guy working in the musical instruments field whom I knew very well. We set the final price, that included a meal offered by me in the best traditional restaurant in Bologna. He underlined that the neck is a mothership replacement dated 2001 for the original neck accidentally broken onstage. Since at the time he worked for the official Italian distributor, he had the neck replaced by a luthier in Bologna running the official Italian Ovation assistance. Unfortunately, when I got home I noticed a very high action caused by four 0.25 shims under the saddle. 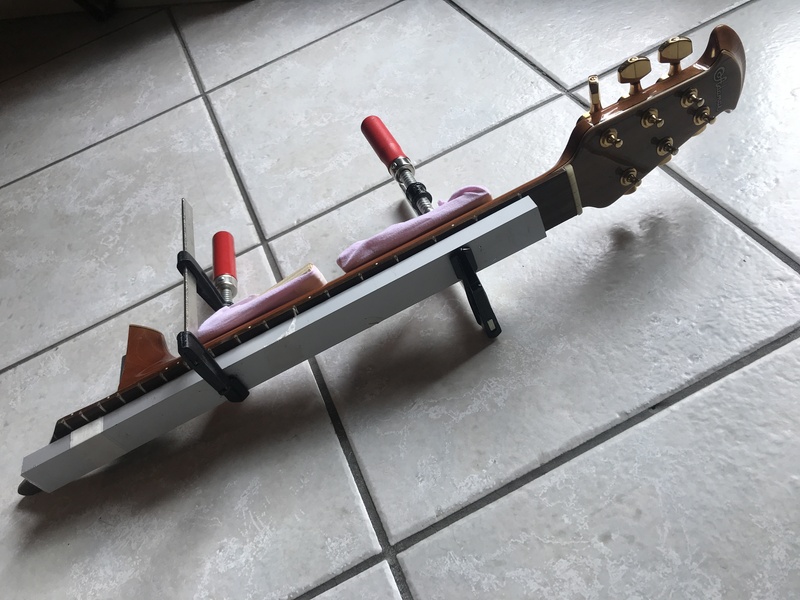 When I removed them the strings started buzzing because a significante bow on neck end and fingerboard tongue, that was curling up. Trying to understand where the problem came from, I could see a shim under the tongue, pushing up. 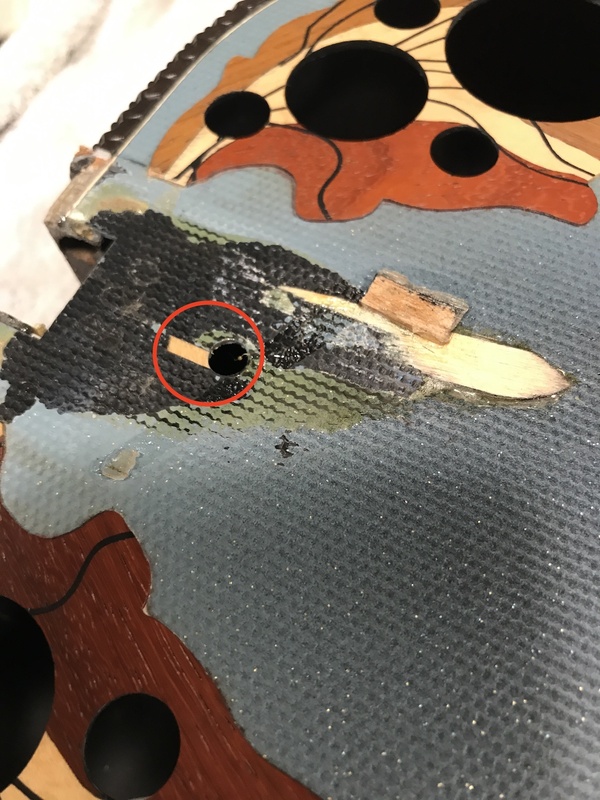 After removing the neck I could see that the guy who had replaced it had made a mess of incomprehensible meaning: he added a small wood block and a wood shim, superglued the neck, sanded off part of the top finish, took off a portion of the carbon top layer. The picture describes well the mess that I found under the neck. The price quotation I had from a renowned luthier for fixing it was significant, but the seller (who was not aware of the hidden mess) agreed to cover the expenses, so I proceeded. We did not want to use any acetone to clean the superglue because we were afraid he could harm the part of the top where the grafite layer is missing. 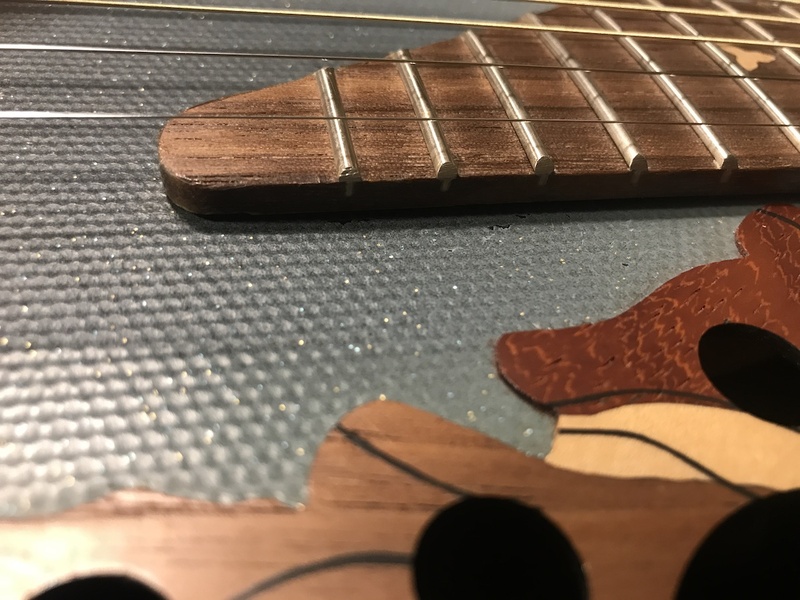 The luthier hand sanded the wood shim to get rid of the extra thickness that had caused the warp in the neck, leaving the excess of glue overflowed on the board, because it does not create any issue and is hidden. The neck was fixed to a rigid bar with clamps, adding shims at the end to push down the tongue. It remained in the controlled humidity oven at 75 Centigrades for an hour, then was let cooling down for a few hours before removing the bar for a light fret dressing and polishing. Total success: after mounting the neck we could remove three 0.25 shims from the bridge, because the neck is now straight and can withstand a perfect action. 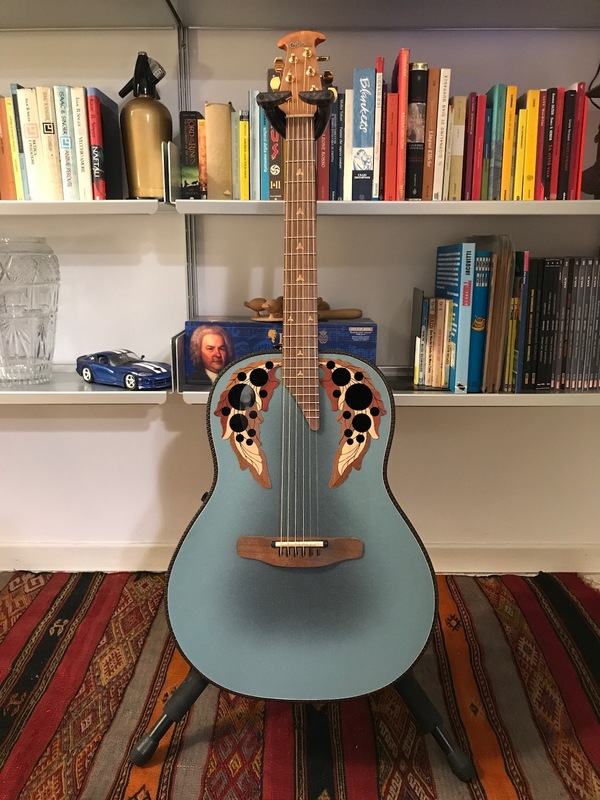 This guitar is quite different in playabilty and sound from my 1983 1681-9 (see it here with the story of the model): the new neck is bigger and slightly wider, but comfortable thanks to the described restoration. The sound is awesome unplugged: the well known, unmistakable, rich and full Adamas 2 tone is all there, big and loud. Once plugged in, the OP-24 sound does not need to be described, it’s just it, the best possible amplified acoustic sound. And the blue top is a joy for the eyes. Thank you Paolo!